Jealous of your friends who have company-backed retirement plans, paid gym memberships and cheap health care? You don’t have to have a full-time job to get those perks. In fact, many companies offer generous benefit programs for their hourly part-time employees. These 10 companies lead the way with awesome benefits for flexible roles that also allow you to attend school, take care of family or do whatever you please. Part-time sales associates, vehicle technicians and more are eligible for 401(k)s after 1,000 hours of service. After 90 days of service, they have access to an employee stock purchase plan. There’s also an employee assistance program available to help with confidential matters, and a discount on the purchase of former rental vehicles. Avis Budget Group includes Payless, Apex and Zipcar rental options along with Avis and Budget. More companies mean more job opportunities! Part-time booksellers at Barnes & Noble receive one week of paid vacation per year after six months working with the company. After working at B&N for one year, you can earn at least two weeks of paid vacation per year. The bookstore also offers basic life insurance to all its employees, with options for coverage of one, two or three times your annual earnings. Coverage for partners and children is available, too. Part-time employees at The Container Store have access to paid time off, a 401(k) plan with an employer match, and medical, dental and vision plans. There’s an employee assistance program to provide confidential counseling and an online corporate wellness program. Discounts on gym memberships and even pet insurance are available, too. Common-law spouses are included in some coverage categories. Hourly part-time employees can receive benefits from Costco once they’ve accumulated 600 hours or worked 180 days. Healthcare coverage includes medical, vision, prescription drugs and core dental plans. All hourly employees working at least 10 hours per week are enrolled in short-term disability insurance, which provides tax-free income replacement in the event of a non-work related accident or illness that prevents work. Enroll in a preventative health care plan as soon as you start working part time at Lowe’s. The available plans do not cover hospitalization or illness, but take care of routine visits and testing to keep you in tip-top shape. Dental, vision, disability and life insurance policies are also available. Lowe’s offers 401(k) matching and an employee stock-purchase plan to part-timers. Lowe’s also shares a group-based auto and home insurance discount program through MetLife. This outdoorsy co-op offers health care, along with life and disability insurance, to any employee who works for REI least 20 hours per week. A sliding-scale premium schedule based on annual base pay determines the employee’s cost. All health care plans cover preventive care, maintenance of chronic conditions and tobacco cessation. REI offers assistance to employees who work fewer than 20 hours per week who seek help navigating the insurance marketplace. There’s an employee assistance program available to all employees. All health care-eligible employees can earn $300 toward their health benefits by taking an online well-being assessment. REI provides a 50% pre-tax transportation subsidy and incentives for how well stores or divisions perform. The company contributes 5% of eligible employees’ base pay to a retirement plan, along with up to an additional 10% through a profit-sharing retirement plan contribution. Once you’ve worked part time at Staples for 90 days, you can sign up for dental, vision and life insurance coverage for yourself, along with your spouse and/or children. Short-term disability coverage is also available. Stick with the company for a year and average 30 hours per week, and you’ll be eligible to enroll in a full-time medical plan. Complete one year and 1,000 hours of service and you can contribute to a 401(k) savings plan. If you want to purchase Staples stock at a 15% discount, you only have to wait 90 days to be eligible. Staples has its own confidential employee counseling program, which you can access through phone consultations or face-to-face meetings. Starbucks is well known for its benefits program for part-timers. All you have to do to be eligible for a host of benefits is work at least 240 hours over three consecutive months, then continue to average 20 hours per week. Health care coverage offered by Starbucks includes routine visits, hospitalization and everything in between, along with vision and dental care. Alternative care options, like acupuncture or chiropractic treatment, are covered too. The company also offers basic life insurance and 401(k) programs. A reimbursement benefit of up to $10,000 is available for adoption expenses. You’ll start to accrue paid vacation hours after 12 months of service. All employees have access to an employee assistance program for confidential counseling, and can apply to the Caring Unites Partners (CUP) program for emergency financial assistance. Part-time employees can get full tuition reimbursement for attending Arizona State University’s online undergraduate programs. 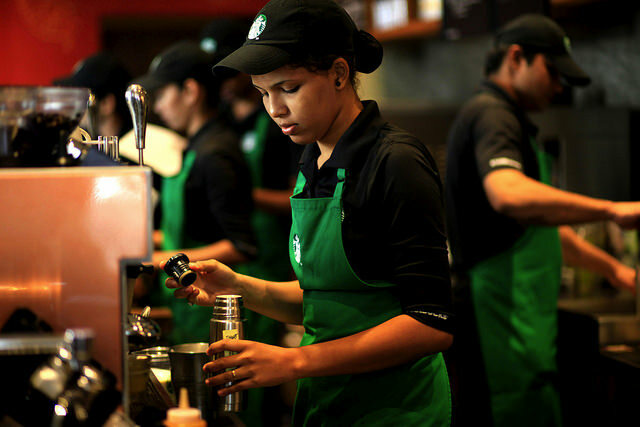 Majors do not have to be relevant to a Starbucks career. Last but not least: Take home one pound of Starbucks coffee or a tin of Teavana loose tea each week. Part-time employees at U-Haul locations have access to limited-care medical plans, plus dental plans. They can also take advantage of 401(k) savings plans and stock ownership plans, travel insurance and banking through a credit union. Part-time UPS employees can take advantage of an education-assistance program that provides up to $5,250 in assistance per calendar year (with a lifetime maximum of $25,000). Your Turn: Do you have a part-time job that offers awesome benefits? We’d love to hear about it!